In this year... Titanic becomes the first film to gross US$1,000,000,000 at the box office making it the highest grossing film in history until Avatar broke the record in 2010.... The U.S. television networks adopt ratings systems for their programming, similar to those used for motion pictures..South Park is aired for the first time on Comedy Central...Buffy the Vampire Slayer premieres on the The WB. Jennifer Love Hewitt (from TV's Party of Five) and Sarah Michelle Gellar (Scream 2) star with Freddie Prinze, Jr., Ryan Phillippe and Johnny Galecki in this terrifying tale of a body that just won't stay dead. This one is not what I would call a favorite... but I do enjoy it now and again. Even though this is little more then an entertaining teen slasher... I do enjoy seeing the familiar faces. Just to name a few we have one of my all-time favorites Jennifer Love Hewitt who I absolutely adored in Ghost Whisperer, then there was Sarah Michelle Gellar who was of course Buffy the Vampire Slayer and then there was Johnny Galecki who was in Roseanne and is currently starring in The Big Bang Theory. But as I was saying... over all not a terrible horror. It is entertaining for what it is... but don't go into this one with too high of expectations. In this year... Former child star Gary Coleman is charged with assaulting a young female bus driver at a California shopping mall.... BBC America launches in the United States...Charmed premieres on The WB...Elton John was knighted by Queen Elizabeth II at Buckingham Palace, London, UK. Well, I see you have Ronin, so that's a must. Not sure if it's your sort of thing though? Did you read the Michael Bay thread? I posted a YouTube video of the final car chase in Ronin. ....and today is Sean Bean's birthday! Thanks for the suggestion... I just watched the trailer... and while it looks like a very good movie... I just not in the mood for it today. Though it is one I plan on watching before too long. The original Zorro, Don Diego de la Vega, is captured and imprisoned just as Spain concedes California to Santa Anna. 20 years go by and his mortal enemy, Don Rafael Montero, returns to California with a plan to become wealthy at the expense of the peasants. The story of an aging blade (Anthony Hopkins) passing along his wisdom and his edge to an angry young thief (Antonio Banderas). The young Zorro learns about politics, love, and war, at the feet of his teacher. His quest for personal revenge gives fire to his role as Colonial Mexico's most swashbuckling activist, one who must fight for his country and his woman (the ravishing newcomer Catherine Zeta-Jones, also quite handy with a sword). I decided to watch this movie mainly for the fact that I never seen the sequel... 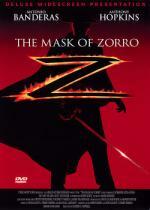 The Legend of Zorro... even though I have owned it for almost a year now (got it for my birthday last year). Since I plan on watching it here soon I wanted to remind myself of this one first. I must say... I forgot how much fun this movie is. I enjoyed it quite a bit. It has plenty of good action/adventure as well as just the right amount of comedy mixed in. The movie is also well paced... you never feel the least bit bored while watching. And the entire cast does a great job. And of course Catherine Zeta-Jones looked just amazing. This is one I definitely feel comfortable recommending. In this year... Bob Newhart receives a star on the Hollywood Walk of Fame... Actor Hank Azaria marries actress Helen Hunt... The Sopranos premieres on HBO... Super Bowl XXXIII: The Denver Broncos win their second Super Bowl in a row, defeating the Atlanta Falcons 34–19. Sitting here looking at the above list and I see a few I would like to check out. I would like to check out Audition as I heard a lot about that one. But also curious about the movie Ravenous as well. Or I could go for a Catherine Zeta-Jones Double Feature and watch Entrapment. Then there is also a few of my old favorites here as well. Oh... what to do... what to do! Well the first thing I need to do is take a break and go outside to cut some grass. I have to agree with Achim on this one. It is a must for any horror fan. A middle-aged widower is urged by his teenage son and a film producer friend to start dating again. They devise a plan to hold a phony film audition to meet new women. The widower falls for a beautiful ballerina with a suspicious past, and their courtship veers from polite romance to psycho-nightmare! I have been curious about this film for some time now. Seen several good reviews for it. And I basically agree. Though I did have a bit of trouble with the subtitles. I am a rather slow reader so there was some pausing and rewinding going on... even though most the dialog was fairly short and to the point.... some of it was not. I like how they built up this movie... basically going from a drama to a psychotic horror movie. There is some graphic violence in this one. It is a pretty disturbing film. And it is one that will leave you thinking well after the movie is over. If you never seen this one... it is definitely worth checking out. In this year... Talk show host David Letterman undergoes quintuple heart bypass surgery at New York-Presbyterian Hospital... Boomerang, The secondary Cartoon Network channel is launched... Big Brother premieres in the United States... Survivor premieres on CBS sparking a major blitz of interest in "reality TV" in the U.S. This time I am leaning towards watching The Gift as the trailer looks really good. And it has several stars in it that I like. Though I am not positive yet as it looks like there is some other good titles in that list.